Studies show that schools that use outdoor classrooms and other forms of experiential education produce significant student gains in social studies, science, language arts, and math. So let's cure our children's "nature-deficit disorder." In my generation, this was the stereotypical rant of the parent who wanted some peace and quiet. So the woods were where my neighborhood tribe played. Just across Merriam Street, past the abandoned car graveyard, were mysterious paths through white pine groves, streams and ponds with frogs and pickerel, and the lore we invented for our redoubts and rambles. But it wasn’t play: it was serious exploration, time for ingenuity with sticks and stones, time and space, quiet. Time to observe and, most importantly, to be unobserved. In the woods, we suburban kids could decant our school and family activities and roles—and stretch. Apparently there was more going on in our outside play than even we woodland orcs knew. Recent commentaries suggest that contemporary American society is in danger of losing some of the critical benefits of time spent in natural surroundings. Here at school, we’ve been picking up on recent articles about the loss of rapport with the world outside. 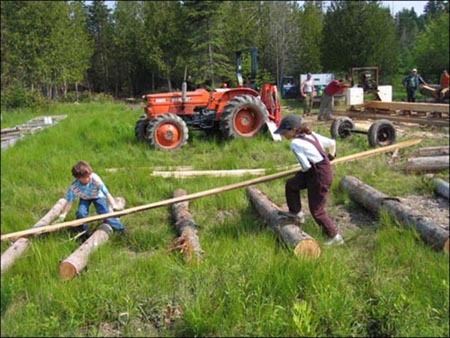 In his 2005 book, Last Child in the Woods, Richard Louv coined the term “nature deficit disorder” to describe the alienation of kids from pine woods experiences. According to a range of studies, children in outdoor-education settings show increases in self-esteem, problem solving, and motivation to learn. In our rural setting, we tend to take at face value the beauty, wonder, and learning to be had on a stroll by the shore or a walk in “Wiggly” woods, or just a lazy afternoon flopping around on the town common. E.O. Wilson says that we are all still hunter gatherers, “and there is something in us, which we do not fully understand, that needs an occasional immersion in nature.” Louv questions the leave-no-child-outside movement in schools and its test-centric focus on learning. “When we challenge schools to incorporate place-based learning in the natural world,” he writes in Orion Magazine, “we will help students realize that school isn’t supposed to be a polite form of incarceration, but a portal to the wider world.” Kids need real wild things and experiences, as well as information. We who live on the shore of the mighty Penobscot River take awe and wonder at nature for granted. Physical benefits to playing outside and breathing fresh air? Preaching to the choir! But I was struck by this data: “Studies of students in California and nationwide show that schools that use outdoor classrooms and other forms of experiential education produce significant student gains in social studies, science, language arts, and math. Studies of students in California and nationwide show that schools that use outdoor classrooms and other forms of experiential education produce significant student gains in social studies, science, language arts, and math. “And the benefits go beyond test scores. According to a range of studies, children in outdoor-education settings show increases in self-esteem, problem solving, and motivation to learn…Research also shows a positive correlation between the length of children’s attention spans and direct experience in nature,” according to Louv. 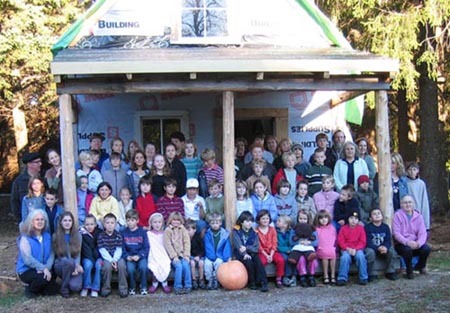 It seems natural that a school with its own timber frame nature center, built with timber that kids helped harvest and mill, sees an opportunity to do more with its natural surroundings. Place-based learning is for us—we have a unique place as base. Sim City is not, since you don’t get pine pitch on your hands. Research shows a positive correlation between the length of children’s attention spans and direct experience in nature. Our student council would like to grow vegetables for the school lunch program. 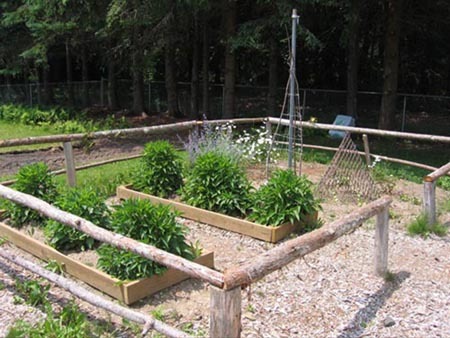 We’ll get our seed order in pronto and do some planting as soon as mud season relents out at Nelson Acres. We have already purchased our monster pumpkin seeds and we’ve been composting manure since fall. Imagine Adams kids harvesting crops that they chose to grow and preparing them for lunch. What would that kid know and understand about food that mere consumers of school lunch can’t? It’s our own roots and shoots program. Our middle-level science teacher, Bill McWeeny, had the honor of hearing Jane Goodall speak in Cambridge recently. She is, of course, the real founder of “Roots and Shoots,” and the kind of inspired naturalist who bridges science and play. Her path in life is a great model, since her inquiry and powers of observation began as a young child in the family chicken coop, and led to defying the received wisdom of her professors at Cambridge University, followed by her famous field study in Gambia. Nature was her greatest teacher, in the guise of chimpanzees whom she dared to name and socialize with. But her arc of nature studies began in that backyard chicken coop, waiting to see exactly where an egg comes from. Her mother was panicked; they searched high and low. Where was Jane? But her mother had the good sense to listen to Jane’s entire, passionate description of her discovery without overwhelming the child naturalist with her personal alarm. If you say, “Go outside and play,” you have to expect “interesting” consequences. What we’re discovering is a field of study, a field of endeavor, a conservation trust field outside of town, a field growing giant pumpkins that we take to the county fair—a field of dreams, with kids and their pocket magnifying glasses examining rare butterflies and wild flowers. We may be on the verge of fields where such quantum leaps of inquiry and imagination take place, that mere test score increases seem paltry measures. We’ll embrace the consequences. I think there just might be room for a hen house behind the nature center….